A few years ago my kindergarten students discovered that the extra paper pile was an excellent resource for a fun free play activity. Unbidden, but with permission, they began making paper airplanes and experimenting to see how to make them faster, stay in the air longer, and do tricks. I encouraged my students to experiment and even learned a few new tricks myself. 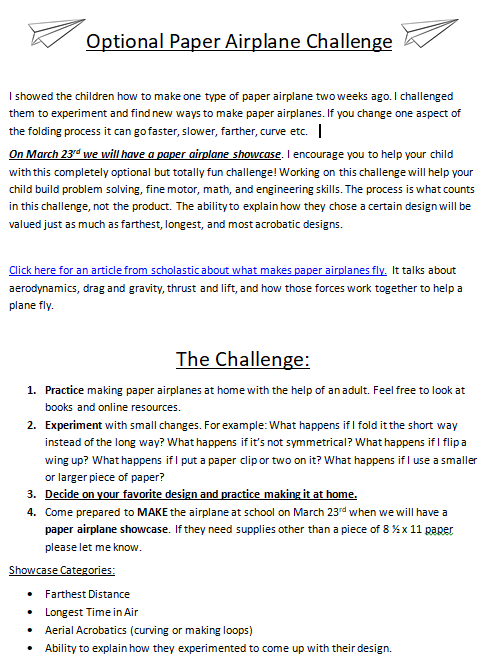 This year I sent home an optional Paper Airplane STEM Challenge inspired by and modified from a Scholastic project along with an article about What Makes Airplanes Fly. Examining the Design. Yup. That’ll Do. Students were encouraged to research paper airplane making and the mechanics behind flight with their families. After about a month of at home and in school discovery time, we had a paper airplane challenge in class. Several kindergartners brought prototypes in from home and demonstrated some amazing designs. Some flew super fast, others glided across the classroom, and of course there were swoopers and loopers. Then, with the help of some wonderful volunteers, my five and six year old scientists constructed various paper airplanes. We voted as a class to conduct the competition outside despite the wind factor. Students competed for longest distance and longest flight time, as well as aerial acrobatics. The challenge ended back inside with students conducting academic conversations at table groups about the design process. There were some tears that dried up during a conversation about scientific experimentation and growth mindset. Weeks later, students are still experimenting with airplane design during free play time. I LOVE IT! This was time well spent and I encourage you to try this with your class… or family. This is yet another example of how powerful play can be. Below is an image of the note I sent home with my students. If you use this idea I’d love to see some pics or video of the process!